Lurean Craig was grateful for the tennis lessons for her children. 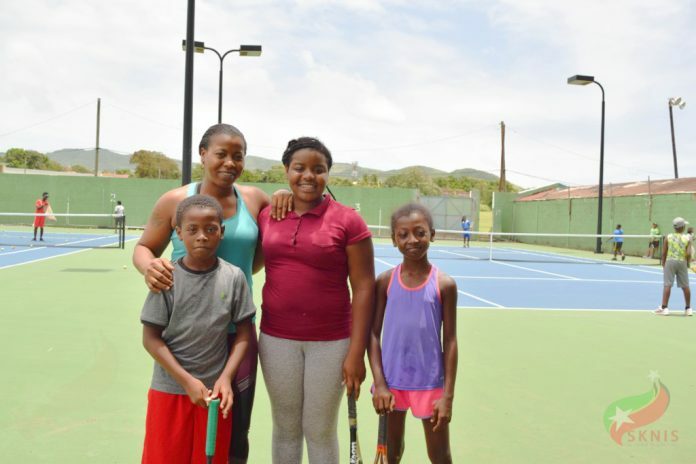 BASSETERRE, St. Kitts – All went well with activities during this year’s sports development camp, which catered to scores of children from communities across St; Kitts from July 23 to 27, according to Director of the Department of Sports, Anthony Wiltshire. During a visit to Warner Park on July 25, Wiltshire said due to a number of factors the annual camp was scaled down. He said the quality of instruction, coupled with the enthusiasm of the facilitators and the children remain the same. “The coaches are enthused with the children and their abilities. The children are excited [and] they are enjoying the activities that they have been doing in the various disciplines,” Mr. Wiltshire said. Tennis, volleyball and netball lessons have been held at Warner Park. Golf instruction was at Frigate Bay, football at The Gardens and cricket at Conaree. Lurean Craig, an avid tennis player, was at the tennis courts observing her three children Diamond, 11, Adanna, 9, and Steve, 8, during the camp. She said that she was grateful for the opportunity where they can advance their technique.